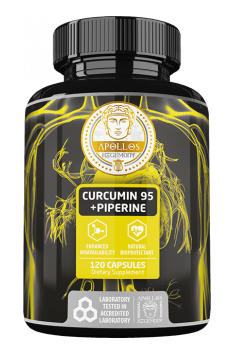 Apollo’s Hegemony Curcumin 95 + Bioperine is a natural dietary supplement which contains the highly bioavailable turmeric extract, standardised for the 95% content of curcuminoids, with addition of piperine (95% black pepper extract) which increases its bioavailability. The product shows a wide range of health-promoting properties which base mainly on its antioxidant, anti-inflammatory and anticancer effects. Curcumin is a yellow dye isolated from turmeric rhizomes (Curcuma longa), also known as Indian saffron. For ages, turmeric has been used in the traditional Far East medicine, not only because of its dyeing properties, but also due to its wide therapeutic effects, mainly anticancer, anti-inflammatory, antibacterial and antioxidant properties. Curcumin shows anticancer and chemoprotective properties. The substance affects modulation of gene expression whose disorders can affect cancer development. It is fluorescent in the UV light. Such property allows for localising curcumin within a cell. In cancer cells, the fluorescence of curcumin was higher than in case of normal cells, which indicates its anticancer properties. What is interesting, despite the fact that curcumin increases sensitivity of cancer cells to ionising radiation, it has protective influence in case of healthy cells. It is associated with its antioxidant properties; as it scavanges free radicals, it reduces damage to DNA of healthy cells which are at risk of irradiation. It is known that prolonged inflammation can contribute to cancer, and curcumin affects also the activity of enzymes responsible for its development – cyclooxygenase 1 responsible for the proper synthesis of prostaglandins and cyclooxygenase 2 activated by mitogens, oncogenes and carcinogenesis promotors. It has been proven that curcumin affects particular lines of cancer cells which results in its support in case of i.a. leukaemia, ovarian cancer, lung cancer, breast cancer and cancers of the urogenital and nervous systems. Curcumin is effective in neutralising O2-– and H2O2 as well as protects from oxidative damage to lipids and proteins. The substance stimulates release of antioxidant enzymes: SOD (superoxide dismutase), GPx (glutathione peroxidase), glutathione S-transferase and catalase. Thanks to its antioxidant properties, curcumin counteracts results of low prostacyclin PGI2 level, which is a factor responsible for relaxation of blood vessels, reduction in blood pressure and inhibition of blood platelets aggregation. There are more and more scientific studies which suggest positive influence of curcumin on the cardiovascular system. It has been observed that curcumin counteracts disorders of endothelium caused by homocysteine as well as reduces the production of superoxide anion radical whose synthesis is stimulated by this amino acid, which is why it reduces the risk of cardiovascular diseases. Moreover, it is an inhibitor of NF-κB, a nuclear transcription factor, whose increased activity induces inflammations and can cause atherosclerosis. It is also suggested that curcumin has positive influence in case of cardiotoxicity of anticancer therapy. Because of its strong anti-inflammatory and antibacterial properties, curcumin can be a promising protection against heart damage resulting from chemotherapy. Curcumin supports production of chaperones which counteract protein misfolding and protein aggregation, support the treatment of Alzheimer’s and Parkinson’s diseases as well as protect from memory loss associated with age. Curcumin reduces cognitive disorders, oxidative stress and beta-amyloid accumulation whose deposits are present in the patients with Alzheimer’s disease. It has been demonstrated that the substance can be involved in reducing nervous system damage resulting from the effects of metal ions which participate in oxidation reduction reactions and affect the growth of reactive oxygen species. Curcumin has positive influence on the bile duct functions. Because of its spasmolytic properties, it stimulates smooth muscles of bile ducts, increases bile secretion and facilitates its flow. Moreover, it helps to keep the proper contractility of gallbladder, which is why it not only counteracts cholestasis and formation of gallstones, but also contributes to their dissolution. Moreover, it shows anti-inflammatory and bactericidal properties. To sum it all up, Curcumin 95 + Bioperine is a dietary supplement which increases immunity, reduces inflammations and protects the nervous system. Curcumin is a promising substance which can be safe and effective as a support in the treatment of i.a. arthritis, atherosclerosis, cancers, asthma and neurodegenerative disorders. Curcumin 95 + Piperine 120 caps. As a dietary supplement, take 1 capsule 1-2 times a day, preferably with a meal. Because of its hydrophobic character, curcumin’s bioavailability is unfortunately quite low. Its quick breakdown in the liver and low absorption from the intestines result in its low level in the plasma. In order to improve curcumin’s solubility, the manufacturers use piperine which increases its bioavailability up to 20 times. Curcumin’s absorption is also positively affected by fats present in diet (curcumin is soluble in fat). This means that it is worth to enrich your meal with e.g. coconut oil, avocado or olive oil when using the supplement. Another important component is quercetin. The substance belongs to plant flavonoids and inhibits the activity of an enzyme responsible for curcumin inactivation. Natural quercetin sources are i.a. red wine grapes, capers, cabbage and bean. What is turmeric root extract? Turmeric root extract is powdered turmeric in reduced volume in order to achieve as high active curcuminoid concentration as possible. Turmeric is a spice that gives dishes a characteristic yellow colour. However, apart from its culinary advantages, it is also valued for its great health-promoting potential, which is why it is sometimes called the “Queen of Spices”. The main active substance in turmeric root is curcumin, which has a strong anti-inflammatory effect. In turn, reducing inflammations helps to relieve pain and inhibit the development of cancer. People who use turmeric extracts can notice an improvement in the parameters marking blood sugar levels and the condition of the cardiovascular system, which is visible in an optimised lipid profile, reduced hypertension, and enhanced blood flow. Curcumin also helps to inhibit DNA molecule damage and reduce oxidative stress. The advantages of curcumin can be experienced by people struggling with the symptoms of depression and anxiety disorders as well. Turmeric root extract can be found in dietary supplements offered by muscle-zone.pl.